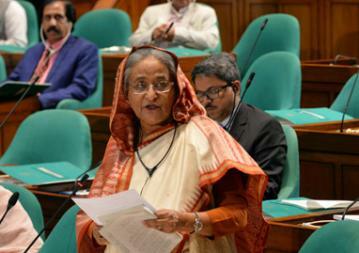 Prime Minister and Leader of the House Sheikh Hasina yesterday said her government has favoured a strong opposition in parliament. “We have favoured a powerful opposition to be grown in parliament,” she said during her around one hour and five minutes valedictory speech on the thanksgiving motion on the President’s speech in the maiden session of the 11th parliament, accorrding to BSS report. Turning to the oath-taking of the Jatiya Oikya Front MP-elect Sultan Muhammed Mansur Ahmed, the premier said Mansur took oath as a mark of respect to the people’ vote and urged other lawmakers to swear in. The opposition leaders’ opinion on bills are very important and as many as 16 amendments have been made to a single bill considering their opinion, she said, adding that the AL government has welcomed the criticize from the opposition for betterment of the country. About the country’s armed forces, she told parliament that Bangladesh armed forces will not be involved in war against any country rather it will engage itself in maintaining peace. “Armed forces of our country will not be involved in war against any country. Rather it will be engaged in maintaining peace,” she said on the signing of the Memorandum of Understanding (MoU) on military cooperation between Bangladesh and Saudi Arabia. Referring to Bangladesh’s foreign policy “Friendship to all, malice to none”, she said that Bangladesh will maintain friendly relationship with all and malice towards none. The world has become astonished to see how her government has been successfully maintaining the foreign policy in case of relations with other countries in the last 10 years, she mentioned. The premier mentioned that such kinds of MoU and agreement have been signed with other countries including Turkey, Belarus, China, Russia, France, India, Kuwait, South Korea, the USA, the UK, Australia, Bahrain, Canada, Cambodia, Italy, Indonesia, Malaysia, Oman, the Philippines, Thailand, Vietnam and Czech Republic. “Bangladesh inked the MoU with Saudi Arabia as they wanted cooperation from us in removing mine from their border what the Bangladeshi armed forces had done successfully in Kuwait border,” she added. Putting emphasis on implementing the electoral commitments, the premier said her government is determined to execute all the electoral pledges as the people of the country voted her party to power for the third consecutive term due to huge development work carried out by her government. Sheikh Hasina said the Awami League was reelected the people do not see corruption, militancy, and terrorism in the country again. The Leader of the House said the people boycotted BNP as the party wanted to go to power depending on militancy, terrorism and corruption. She, however, greeted all the parties for taking part in the 11th general election. Highlighting her government’s successes in different fields, the premier said they are implementing mega projects like Padma Bridge, Rooppur Nuclear Power Plant, Rampal coal-fired Power Plant, Deep Sea Port, Payra Sea Port, and Bangabandhu Sheikh Mujibur Rahman Tunnel under the Karnaphuli River. “Once the projects are implemented Bangladesh will witness a huge progress,” she said. Talking about employment generation, Sheikh Hasina said her government has taken various programmes including “My House, My Farm” and is establishing 100 special economic zones to this end. “Over one crore people will get jobs alongside attracting foreign and local investment once the 100 economic zones are established,” she said. Sheikh Hasina said the discrimination between villages and towns has been decreased by manifolds due to the timely and pragmatic measures taken by the government as all people of the country are now getting advantages of the development. There is no existence of ‘monga’ now in northern region following successful implementation of massive social safety-net programmes (SSNPs) there. She criticised the military dictators for wholesale filing of waterbodies and said her government has taken steps to stop filling of waterbodies. Speaking on giving recognition of Quami madrasa certificates, Sheikh Hasina said around 20 lakh students have been studying in Qaumi madrasas across the country and most of them are coming from very poor family. Describing the madrasa students as sons of the country, she said her government has given the recognition as the students can get jobs with the certificate. As many as 5275 digital centres have been established across the country aimed at creating employment and each of the centres is generating employment of two persons — a man and a woman, while many others are doing various businesses centering the centres, she said. The prime minister said the AL government is giving various incentives to the private sector so that they can create employment. “We’ve given approval of 44 TV channels to create employment,” she added.